I've now done three works based on the little field sketch of the Orchard Oriole on nest. As I did so I let the urge to abstraction have free rein. What is 'The Urge to Abstraction?' I just made the term up but I wouldn't be surprised if it already exists as an art term. For me it means moving away from an attempt at full verisimilitude to something more expressive in both form and color, maybe even in brushwork, texture and pattern. Since it's been a very long time since I studied art history in school I have no idea what might be taught now. I'm assuming things haven't changed. Perhaps they have. In any case realism, particularly photographic realism, is only one form of visual art, regardless of subject. Since I've taken up bird art I've tried to be somewhat accurate in what I portray. I don't knowingly put a Mallard bill on a Forster's Tern. But I'm not a slave to photographs either. If you look at the history of world art you see how much art has been representational without being realistic. Think of 'folk art', 'native art', Oriental brush painting. There are many, many examples. Almost all cultures have exhibited an impulse to art. Few have exhibited an impulse to realism. I have nothing against realism and love much of it, particularly when we're talking about the best art of museums. Who can find fault with Durer for instance? But there's also a larger impulse to abstraction, to make something that suggests the subject but doesn't resemble a photo. I think there are probably very many reasons for this impulse to abstraction and I won't begin to enumerate them. I'm an artist not an art historian nor an art theorist. The reason I even bring it up is that as I've worked on my Orchard Orioles I've found myself eager to be somewhat abstract. The advantages to me are a heightened sense of color, shape, harmony of shape and color, etc. There are similarities to music. Music can be thoroughly expressive without having a single lyric. So can art. And I think it's that expressiveness that I'm seeking. The pastel at top, which I'll probably do at least some more work on, is the last in a series of three. I showed the first earlier this week. The middle version is below. After I'd done the watercolor above I realized that it was heading in the direction that I wanted but that it still seemed a bit amorphous, not fully formed. So I thought a third version in pastel might allow me to push the abstraction further and to simplify it. Charcoal and pastel seem to lend themselves to simple, bold statements. Often I find that simplification is the answer. I'm not sure I've quite reached that here. But it's heading in the right direction. 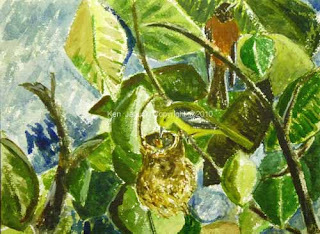 I believe it is expressive, but still keeps the original subject of two Orchard Orioles, deep in light dappled foliage. I think that this is type of abstraction is where I should continue to develop my work. My history in art is one of following the urge to abstraction. 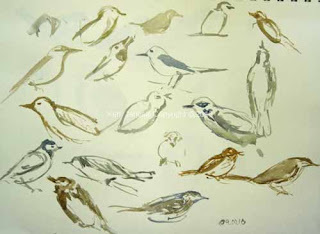 I've sublimated it during four years of drawing and painting birds. But now that I feel somewhat comfortable with them I think that I'll continue to follow the urge to abstraction. I'm writing this in the hopes that whoever does read it and wonders about my varying 'styles' will understand why I place such emphasis on the abstract. Really it is just the expressive. It was a great pleasure, and surprise, to find a female Orchard Oriole feedng her young in a nest at Morris Arboretum early this summer. I did a quick sketch as shown above. But it was hard to see the bird buried in the foliage, especially as she was there just momentarily then headed off in search of more food. When she returned it was always in a slightly different pose. Since I knew I'd probably want to do a painting of this I also took a number of photos for reference. Unfortunately because she was buried deep in foliage they turned out very dark. As I watched her I eventually discovered the male in the same tree, not close but at least in the same tree. So I took some underexposed photos of him as well. 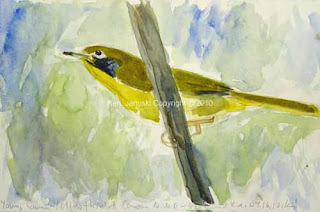 When I began painting birds I relied on photos that I'd taken. I found a number of problems with this: I was getting my inspiration from marks on a flat surface, not from a living thing in a living three-dimensional world; I also often found myself hypnotized by the photos composition. 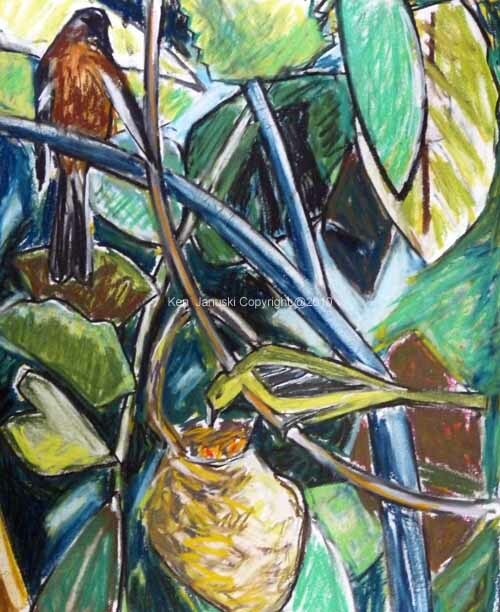 I had a strong tendency to come pretty close to copying not just the bird, but also the composition when I painted. A slave to my photos? Not completely, since I tend to work loosely, and eventually abandon my original source. But still more indebted and limited than I liked. So 12-18 months ago I forced myself to do real field sketches. They might be bad but they were honest. Then over the last few months I've looked to my sketchbooks for ideas for paintings, not my growing collection of photos. It's so much more inspirational to work from sketches rather than photos. Just one problem though. 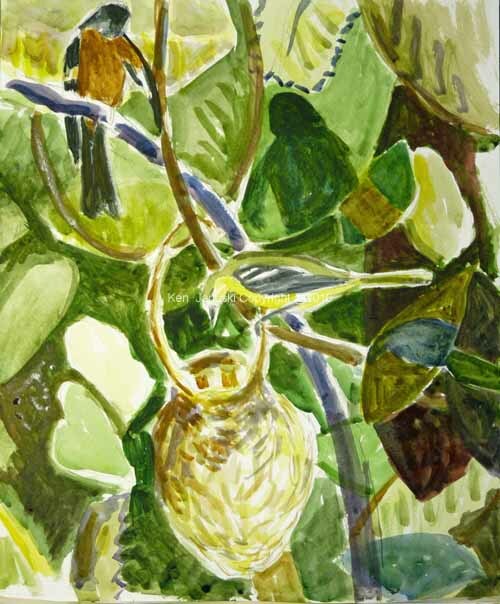 Sometimes my sketches don't show much, as with the Orchard Oriole on nest. I started this painting three days ago, thinking I could get away with just using the sketch. But as I worked on it I realized I was fudging the bird. So I ended up referring to photos of both male and female more than I really liked. Still, at least for the female, the pose came from the sketch, not any photots. I ran into another problem: heavy foliage. My guess is that this is the bane of many an artist. Birds, or other animals, are seen in habitats, many of which include leaves, or grasses which are just as bad. Some artists solve this my painting every little detail, or at least they're skilled enough to fool the viewer into thinking that they have. Others just put a few loose brushstrokes around the birds, happy with the mere suggestion on an environment. And then others try an obvious shorthand. That's what I've tried here. The thing is, I don't have a shorthand language for leaves. Each painting I feel like I'm developing one all over again. That may be why I spent three days on this. I kept changing it, veering off in various directions, trying to find something that worked. This is done for now. I've learned something and the result I think is cohesive. Most likely I'll try this scene again, maybe next week, maybe in a year or more. I'm happy that I've gotten to the point where I'm now using field sketches as my inspiration. There's a lot of freedom in working this way, though also, as you can see, some difficulties. I believe that this painting is now finished. After I looked at the last version I thought, no this isn't done. It just doesn't have any life to it, especially in the overall feel of the painting. As I've mentioned ad nauseum I like improvisation in art, at least in my own art. I'd probably have a heart attack if I did a painting with high finish. It just makes me queasy. * That may be why many artists prefer sketches to finished work, though they need to make finished work in order to sell it. In any case I've wanted to use some of the improvisation that I've used in my charcoal and pastel work in my watercolors. But I rarely try it. The problem is that watercolor doesn't lend itself to improvisation. Once you make a mark you're generally stuck with it, at least if you want to keep the freshness and luminosity that is watercolors main strength. And yet it is possible for people who have really mastered watercolor. So when I looked at this painting I thought, Enough! I've got to try something bolder here, something more like my abstracted Green Heron drawing of a month or so ago. So that's what I did. I did risk having it turn to dark, bluish mud. But I think I've been successful. Because you're more or less stuck with the marks you make in watercolor it's tempting to draw careful outlines and then color in with teeny brushes. There's much watercolor work of this sort. And some of it is quite beautiful. But you shouldn't have to limit yourself to that. So here I used some bigger brushes with a lot of paint on them. I let wet colors run into one another. I made marks that don't really represent anything. But to me they help to hold the painting together. To me at least they have helped to create a painting that vibrates with color, light, pattern and still is true to its subjects. When I finished this last night I realized I might wake up this morning and think it was a disaster. But I also thought it was would have been worth it. Sometimes you just have to push your art, or anything else, to another level. In doing so there's always a great risk of failure. But it's also the only way to grow. *Having just been perusing the 2010 Birds In Art catalog it's fresh in my mind that one of my favorite paintings in it is a marsh scene by Robert Bateman. It's taken me a very, very long time to come to appreciate Bateman. And it's all because of his high finish. But as I've read more about him I've realized that's something he likes and something he's done for a long time. What I think makes it less bothersome in him is that he combines it with a real knowledge of the entire environment he paints as well as a great design. And he is a true environmentalist. But still my reaction, maybe even my taste, is to pass by this type of 'high finish' painting. It's just something that is not to my taste. But seeing that some artists like Bateman also do sketches from life that are both good and felt show that they choose the high finish intentionally, not to cover an inability to feel the scene portrayed. It's so antithetical to my own tastes that I have a hard time understanding it. But I have no doubt that it is genuine. This sora is strictly virtual though. I went to Morris Arboretum again yesterday but didn't find the sora. I did find two Solitary Sandpipers and one Kildeer though. When a Solitary approached within two or three feet of me I was shocked to see how small and delicate they are. Since I'd always seen them in scope or binoculars before I didn't have a good sense of scale. But these were so close that I saw them with my naked eye. As a side note though, they didn't get anywhere as near to me as the mink, which almost walked across my shoes. I'm not positive that it was a mink and in fact had never even seen one before the animal we saw last week in West Virginia that seemed to be a mink. 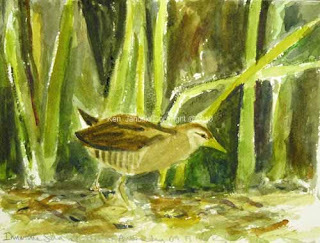 With this one I had edged close to the shore, but was still hidden by reeds and trees, so that I could sketch the shorebirds. I think I must have hidden myself so well that the mink didn't even know I was there as he scooted by at water's edge. Back to the Solitary. I did a number of field sketches, none too successful, trying to capture their delicate shape. 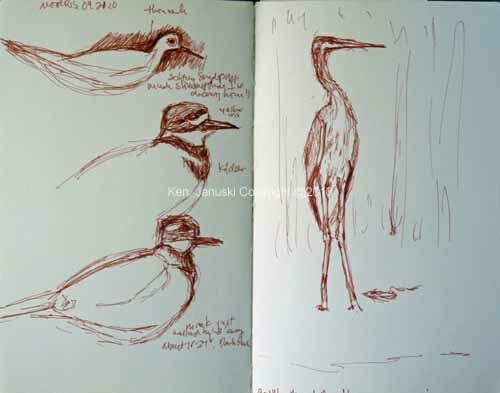 Also did two kildeer sketches, of varying quality, as well as a Great Blue Heron in an attractively awkward stance and one Northern Flicker. As I've said many times I really do love improvisation in art. I've been able to use it in pastel but never with watercolor. Watercolor is just so unforgiving that I've always been afraid to try it. Today I finally decided to give it a chance. I also chose larger paper than usual, 12x16 inches. I thought this large size might force me to be a bit looser, and not fiddle too much. 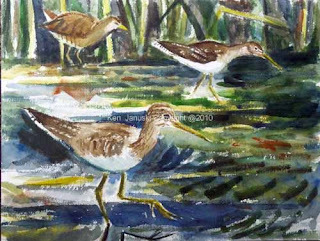 For the composition I used two different photos of Solitary Sandpipers and combined them with the sora, based on my last watercolor. 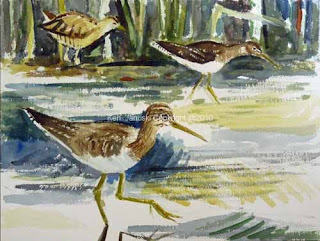 Oddly enough when I sketched the Sora, there actually were a Solitary Sandpiper and a Lesser Yellowlegs right in front of it. But I wasn't interested in them then so I didn't sketch them. In any case this watercolor is an improvisation in composition as well as technique. But it still has its basis in reality. I don't know if it's done. Since it's my first time with something like this it seemed good to leave it rest at this stage. Though we did have a wonderful vacation in West Virginia, the birds were a bit sparse as I said in last post. Not that I'd want to give up the closeup view of the Ruffed Grouse, which I might have forgotten to mention in last post. In any case we decided to take advantage of yesterday's beautiful weather and do some brief birding at the small wetlands at our nearby arboretum. Since we didn't get there until 11:30 we didn't expect to find much. But we ended the day with about 25 species, almost 50% of our number from a week in West Virginia. It brought home to me how spoiled we are by all the good local places to bird. If we needed anything to symbolize that thought we surely got it with our last bird of the day, an immature Sora, the first Sora we've ever seen in Philadelphia. That's it in the watercolor at top. 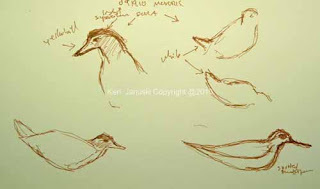 This sora showed a different difficulty you can have in sketching birds - when they're at the limits of your optics. I can't recall offhand but I think my scope is about 28x. That just allowed me to see him buried in the dark of the shore and reeds. He moved around far less than warblers but he was just too far way to see well. The sketches below are the best detail I could get down. I had thought maybe I could use the photos I took for further reference. 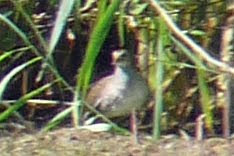 But since my camera is only 18x all they show is a pixellated area that might or might not be a sora. So what I've done in the watercolor is mainly based on memory. I have made the chest area maybe a bit dark. The most striking thing was the innocent look of the face that I think one sketch shows. 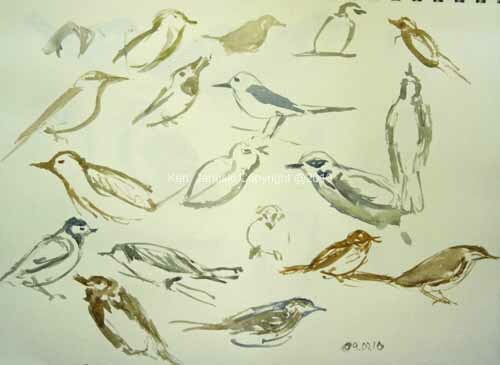 My online friend Nick Derry, whose link is at right, has shown in his recent paintings how really full, rich work can be made from brief field sketches. So I hope to use that example to do something with this great opportunity. That bottom right sketch by the way is not a sora, but a Solitary Sandpiper, one of four shorebirds that we also saw. In looking through my photos a few days later I realized that I did get one or two semi-recognizable photos of the sora. One is above. A week in a high mountain valley. Hemlocks, hickories, maples, even a Devil's Walkingstick right outside the cabin door. 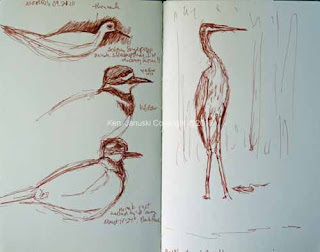 A perfect opportunity for seeing and sketching birds right? That's what you'd think. But we didn't see a single bird outside our cabin. For all our birding in the area we saw less than 50 species. This really was a surprise. I think it just indicates that we've been birding areas with higher than normal numbers of birds for years. Perhaps this sparse distribution is really more indicative of what most of the country is like. In any case we were lucky enough to be in a place where Black-throated Green Warblers bred. At least some were still around and I was able to get quick glimpses of a couple and then get them down on paper. 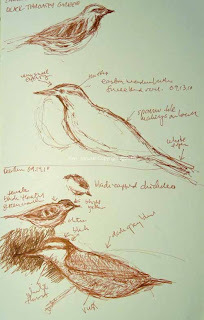 Red-breasted Nuthatches, Black-capped Chickadees and Eastern Meadowlarks also breed there and all showed up long enough for me to also sketch them on the sheet above. 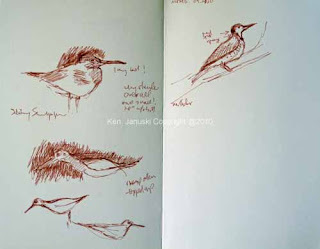 The Meadowlark stayed still for the longest amount of time and was probably the most exciting to draw. But I was also happy to feel that I was finally progressing in my ability to draw live wood warblers. Our last day there brought showers and eventually thundershowers. So we spent the last afternoon indoors. Earlier that morning as well as the previous night I'd seen a mystery bird that looked much like a Common Yellowthroat, which were common in one area we birded, but had a touch of blue and black on face. It wasn't the typical male mask. But it couldn't be a Mourning could it? Finally I realized that it was a young male, whose facial pattern looks almost blue-black. I'd taken some photos the morning of the showers and so apent part of the afternoon indoors doing this quick watercolor while looking at the photo in the camera. My wife thinks the bird is too thin, not full enough. But I think this is how he looked, stretched out, probably looking for food. It is surprising how differently the same bird can appear in different circumstances. In any case I was happy to be able to further along my attempts at Wood Warblers. Soon they will be gone until next spring. So I need to get as much done as I can. they may all be here tomorrow, at least if you live in the NE United States:Monumental Migration. Along with other migrants of course. Well it's noon on the day of the predicted fallout. I spent 3 hours at Carpenter's Woods in Philadelphia and found a few birds but not a whole lot more than I would have expected. The best bird was a female Blackburnian 50 feet away and 100 feet up flitting through the leaves. Not much of a view but fortunately it's hard to mistake a Blackburnian. But I almost did. There was another bird in the same area that I and another birder first thought was a Black-throated Green Warbler. About 15 minutes later I sketched the face as I remembered it. The face was bright yellow with dark auriculars.When I got home and checked the field guides though I wondered if it actually could have been the Blackburnian. It also has dark markings around the auriculars. And it was so far away. Finally though I stuck with the Black-throated Green. The color was yellow not yellow-orange and the auricular patch seemed more distinct than in the Blackburnian. So it was nice to see these but it really wasn't a fallout. 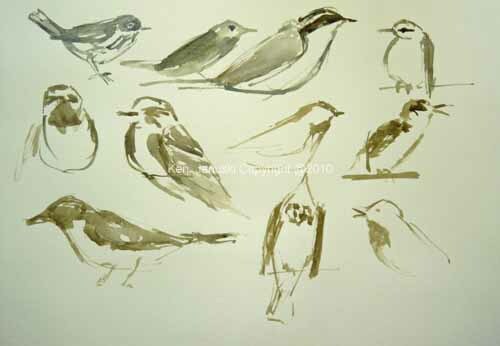 Other warblers included another Black-throated Blue feeding on Devil's Walking Stick, a male American Redstart and two Magnolia Warblers, one of them sketched from memory at lower right.. A Eastern Wood Pewee which has been there for weeks if not months was also there and is on top left of sketch. 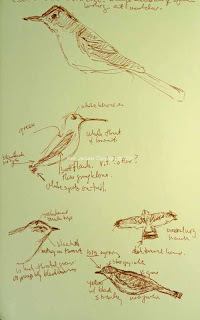 Ruby-throated Hummingbirds have also been regular visitors there and one is included on the sketch. The most surprising bird was a Broad-winged Hawk. I'm sure that's not so unusual this time of year but because of the wooded nature of Carpenter's Woods you don't see that many. Mainly because you're not looking up at the sky. All in all a beautiful day and a good day of birding. But for me it wasn't a fallout day. I hope it was for others. Wood warblers are moving through again on their southbound migration, staying still for all of a split second before directing their attention or perhaps their entire body to a new potential food source. I've written about this before. Their quick movement, often hidden behind foliage, makes identification difficult and sketching almost impossible. And yet I can't help but want to get them down on paper. 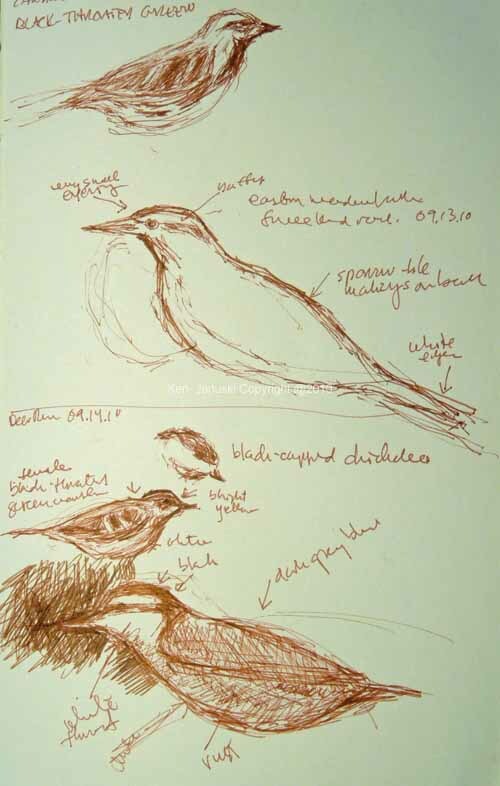 So today I returned to an old trick: sketching while watching 'Watching Warblers' by Michael Male and Judy Fieth. It's a great film to begin with but it's also very good for practicing on warblers. The reason is that they move just as fast here as they do in real life. The main difference is that these are pretty much out in the open and you can practice one species after another. I'd been wanting to try them in watercolor so that's what I did today. I knew I wouldn't begin to have time to consider color though. I know this seems like a crime given the spectacular colors of wood warblers but that wasn't my concern here. I just wanted to practice getting down their shape. So I mixed up one color from Ultramarine Blue, Burnt Umber and Raw Sienna. That was enough to work with it. To my surprise I found I liked this medium better than any I've yet tried for sketching warblers. The speed of the brush, a Winsor and Newton No. 7 series, number 1, seemed equal to the birds. Finally I felt like I found something that might have a chance of keeping up with the birds. I think part of this, as I've mentioned in previous posts about 'painting with a brush', is that a good brush is a wonder of a tool. It can make fine lines, broad areas of tone and color and everything in between. In one nanosecond it can make the line of the bill of a wood warbler and one nanosecond later it can be used broadly to create an entire wing. It can do the spot of an eye, then instantly the entire head above it. I'm not going to identify the warblers here. Some may be recognizable, and maybe most not. I'd guess there are about 20 species portrayed. 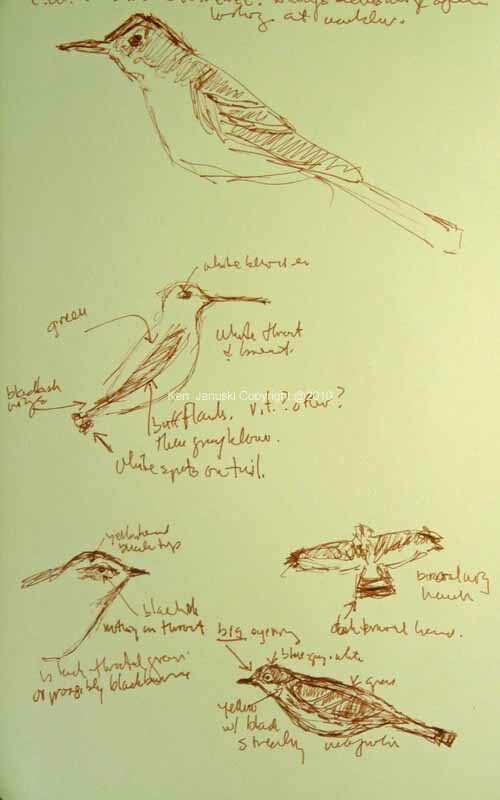 But the important thing I've learned is that it might be possible to try this setup in the field when sketching warblers from life. It will still be difficult because I need to hold water, sketchbook, brush and binoculars all at the same time, with just two hands. But I think it's worth a try. 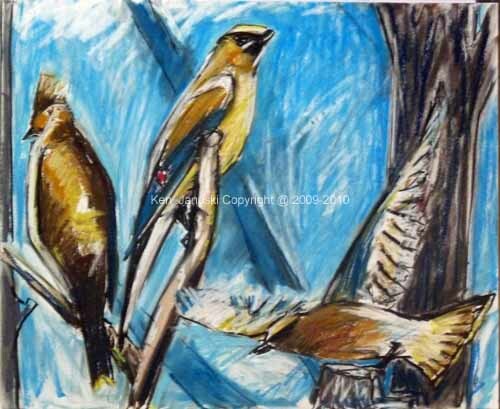 I also wanted to show the final version of the Cedar Waxwings pastel. It's gone through many changes only to end up back pretty close to the original version. As the title of my blog says, 'Art, Birds, Nature.' That was a pretty prophetic title when I picked it a number of years ago, especially as the most important subjects over time have become art, then birds, and finally nature. Today nature comes to the forefront for a change, though this is cultivated nature, e.g. tomatoes. Though it's not quite fall, and I'm not trying to hurry it along, we have already started drying tomatoes. Our own harvest has been horrible this year so most of these are from our CSA, Red Earth Farm. 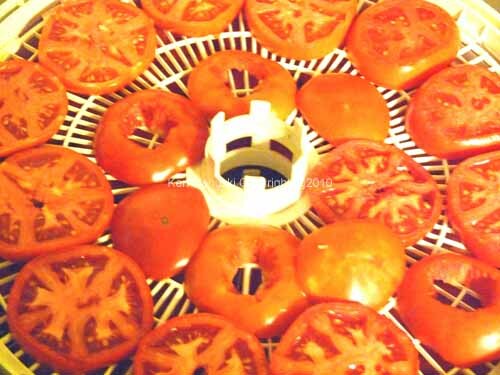 One of the great pleasures of fall is the smell of tomatoes drying in our dehydrator, and later in the season, of New Mexico and Poblano peppers. Nothing smells more like fall to me than the rich aroma of drying peppers, with the exception I suppose of burning leaves. I'm surprised some edgy entrepreneur isn't trying to market 'essence of drying peppers' at about $500 an ounce. Soon I'm sure. In the meantime it remains something to be enjoyed by everyone for very little cost; a dehydrator and some good New Mexico/Anaheim or Poblano peppers. Last year we also dried so Cayenne peppers. What a rich hot pepper that created. I suppose you could also say this is really about conservation. As much as we can we like to use nature's produce, even the weedy Epazote that Jerene picked today, we also like the idea of not being wasteful. That's where preserving comes in. 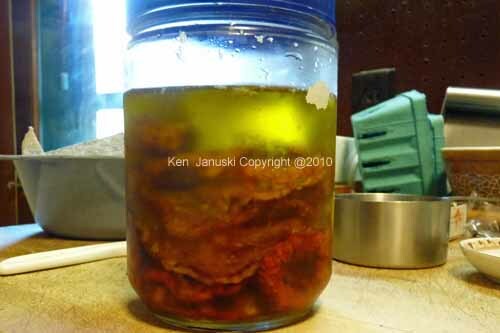 We tried our hand at canning and freezing many years ago. But neither the effort nor the results seemed worth it to us. Given the extremely high quality of stone fruit this summer though I have to say there is some temptation to can some peaches. In the meantime though we can definitely preserve with our dehydrator. My primary artistic style isn't bold or impatient, regardless of what I said in the last post. I realized this as I started work on the pastel drawing at top of a number of Cedar Waxwings. I'm sure some readers may be getting a bit bored with something so self-referential as my 'style' so I'll keep it short. 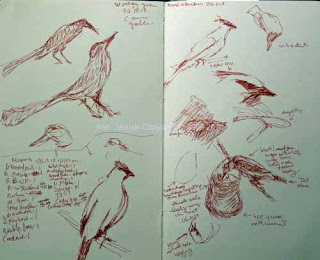 I began this drawing by looking through my sketchbook of field sketches. 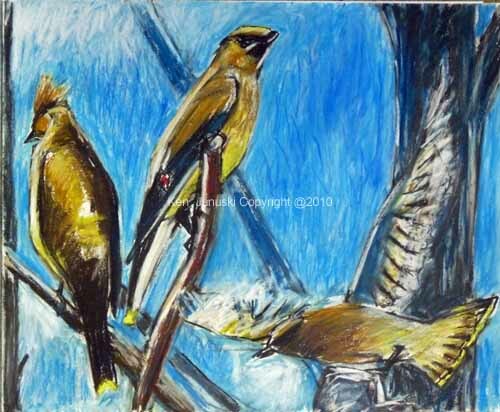 There I saw one of Cedar Waxwing that I liked. That got me to looking through the photos I'd done of Cedar Waxwings, which in turn got me to do numerous pencil sketches. 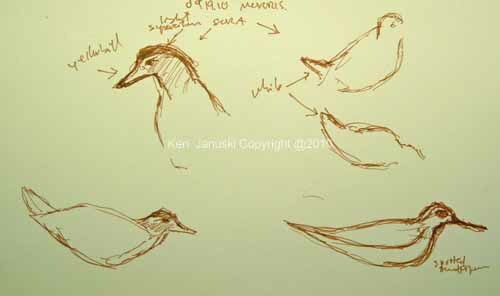 Then I tried some thumbnail designs, moving birds this way and that until I had a pleasing, and believable, composition. Then I forgot much of what I'd just done and scribbled the three birds onto a 14x17 sheet of Strathmore #500 Bristol paper. And this is where 'style' comes in. I was reminded once again that I really like to improvise, to put something on paper or canvas and then respond to that. That's what I did here. Within 10 minutes all birds had changed position or shape or size. It's been said that some artists, for instance Beethoven I think, and Hitchcock, have a mental picture of their work before they start. They just transpose it into the proper medium. For me I don't really know what I'm doing until the medium gives me some clues. My plans are very vague. Not all my work is this way. Some try to stay truer to the subject and keep improvisation in check. But my background and my preference is improvisation. I like a dialog with the medium in which I work. This is where I'm comfortable. I'm not sure if the dialog with these Cedar Waxwings is done. Most likely I'll do some more work on it. Hopefully this will be the end of 'style' comments for awhile. My guess is that it gets tiresome for those who come hear to read something about birds and/or nature.